You may already know this, but low tide is good and high tide is bad – that is, at least when you’re trapped on a rock formation outlet that’s circled by a ravenous great white shark. Also, you can rest on a floating dead whale carcass, while evading said shark, but not for long. Those helpful tips (or reminders) may seem obvious and/or ridiculous, which is how some will describe “The Shallows”, the latest from director Juame Collet-Serra. That’s understandable, but I’ll describe this woman vs. shark thriller as a solid and fun summer outing at the movies. But, then again I have certain predilections about this kind of movie…. I’m kind of obsessed with shark movies – no, not that sharksploitation “Sharknado” crap or the Dolph Lundgren v Shark variety and not the teen blood bath types – but moreso the kind that range from the hyperventilating what-would-I-do-if-that-happened-to-me type, such as “Open Water” and the wonderfully schlocky smart sharks of “Deep Blue Sea”. I also enjoy a good isolation/survival movie, where a character (or small group of characters) must figure out how to stay alive as pending death looms by utilizing their surroundings – “Buried”, “Frozen” and “The Grey” come to mind as examples, albeit depressing ones. I don’t know why, but I like surfer movies – it could be because I know I could never do what I’m watching others do and what I see them doing is cool and impressive – like “Blue Crush” and “Soul Surfer” (based on a real-life shark attack: bonus). I think it started with “Point Break”. I have a fondness for strong female-centric action movies, which probably stemmed from watching Ellen Ripley fend off alien(s). All that is to say that “The Shallows”, which pits Blake Lively against an enormous great white, is in my wheel house. I didn’t even know about the movie until less than a couple of months ago and once I saw the cool trailer it was immediately on my Most Anticipated Summer Movies of 2016. Lively plays Nancy, a med student dropout from Texas who’s taking in some alone time down in Mexico to figure things out and get a renewed sense of self. She seeks out a secluded beach her recently deceased mother visited when she was pregnant with her. The goal is to surf the tempting waves of the mysteriously unnamed beach and enjoy an adventurous afternoon. The plan wasn’t to do it alone however, but her traveling buddy is nursing a hangover back at the hotel. Disappointed but determined to see things through, Nancy has a local (Óscar Jaenada) drive her through a forest to the paradise-like sands. None of the introduction takes long, since Collet-Serra knows why we’re watching, but it does make sense to give us a little background on Lively’s character. We need to get invested and it’s obvious some of what we learn will play out later. Sure, having the photos she flips through on her phone, the texts between her buddy and the FaceTime with her younger sister (Sedona Legge) and father (Brett Cullen) back in Galveston, is a cheap way to provide exposition and it feels kind of forced, despite the obvious form of communication for this twenty something and her reliance on her smartphone. As Nancy catches some sweet waves in the lagoon, she runs into two local surfers and three of them enjoy hours of surfing amid the sun-soaked waters. Before daylight fades, Nancy decides to go out on her own before heading back to her hotel as the two surfers head out. She relaxes on her board, enjoying the company of dolphins and notices a humpback whale carcass floating about in the distance. Just as she is catching a wave back, she is attacked by a great white who was feeding off the dead whale. Nancy takes a bite to her leg, loses her board and is able to swim her way to a nearby rock formation that’s about 200 yards away from shore. Reeling from the pain, she begins using whatever elements she has at her disposal to care for her wound and fight to survive as she realizes the determined shark has no plan of leaving. With sunset looming and high tide pending, Nancy must submerge her fears and figure out a way back to the beach. Screenwriter Anthony Jaswinski is no stranger to horror, having paved a path in indie flicks of the genre, like “The Vanishing on 7th Street” and the upcoming “Satanic” and his reliance here on a basic premise here is the story’s strength. Sure, there’s some melodramatic family fluff – Nancy’s father wants her to finish school, yet she’s still affected by her mother’s long battle with cancer – but Collet-Serra’s film excels because he keeps it simple, deliberately honing in on the escalating peril. Reuniting with Flavio Labiano, his cinematographer on “Unknown” and “Non-Stop“, Collet-Serra balances his approach with close-up shots, swirling and lingering underwater shots and bobbing on the waves as well. There’s a great sense of geographic placement too, showing where Nancy’s refuge options are – the whale carcass, the rock formation and a tethered buoy – all of which, form a triangle that’s fading as the high tide slowly approaches. 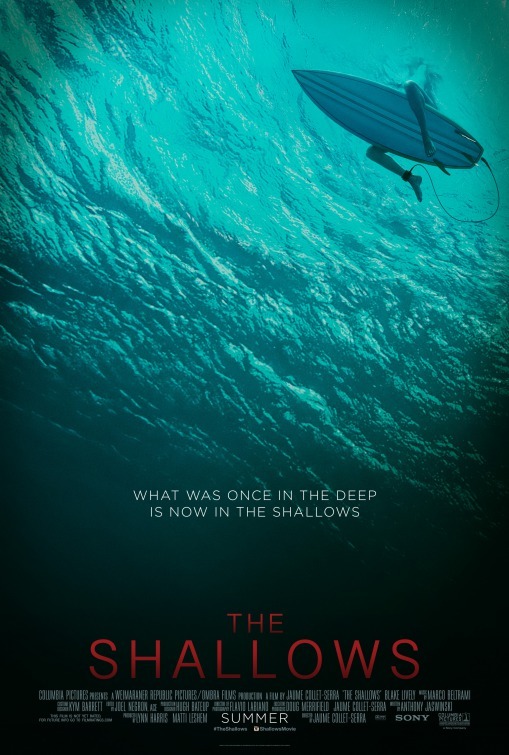 The filmmakers actually inject “The Shallows” (which was filmed in Australia) with far more surprises than viewers will expect, especially those jaded purveyors of this particular subgenre. Of course, there’s a good deal of silliness that we have to wade through as well – I’m not going to get into it all, since it touches on details that are better off experiencing for yourself – but you’ll know and you’ll roll your eyes, laugh and enjoy it. And then scratch your head later. Some may bemoan how coincidental Nancy’s medical training plays in her survival, but they’ll miss how purposeful it is to her characterization. It makes her an analytical and adept lead. The same people who complain about movies that still feature damsels in distress will likely balk at the fact the Nancy has these qualities. So be it. She’s not a ditz or a screaming victim, which is a welcome change right there. Lively is as impressive here as she was in “The Town” and “Age of Adeline” – no, I’m not just referring to the bikini the camera scans throughout the movie – and although she becomes something of a MacGyver at sea, she’s nevertheless easy to follow. She may not be the best actress around, but for some reason I enjoy her unpretentious demeanor and she does quite a fine job conveying terror while acting against hardly anyone else, save for a seagull her character names Steven (heh heh). Inevitably this close to Shark Week, there will probably be those who claim “The Shallows” is yet another movie that vilifies a magnificent creature. But this isn’t a documentary and it all started with Steven Spielberg’s “Jaws” the quintessential great white movie. “The Shallows” doesn’t set out to show how sharks truly behave – it’s simply a straightforward shark attack movie that legitimately had me squirming in my seat, gripping my arms rests with my sweaty palms. 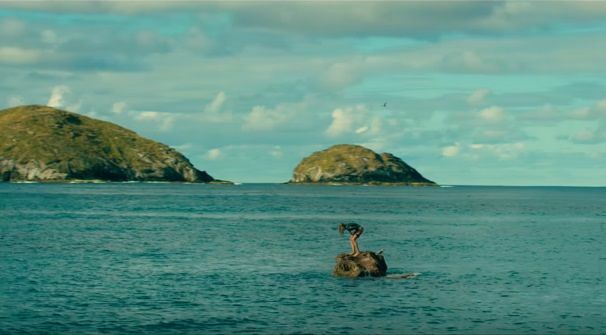 That’s where “The Shallows” succeeds, offering an exhilarating fun viewing experience, which rises above the recent crappy summer sequels we’ve been given.